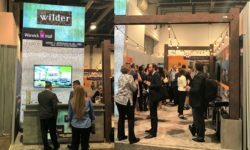 The Wilder Leasing and New Business Development teams spent much of last week in deal-making mode at ICSC’s annual RECon show in Las Vegas. The event was attended by over 30,000 real estate professionals representing brokers, landlords, tenants, municipalities, and more. Here are a few key takeaways from my conversations and observations. Experiential retail is on the rise. The leasing mall was packed with boutique fitness franchises, personal services brands, and entertainment concepts. Almost every panel mentioned the shopping experience as a key driver of sales. Even tenant and developer booths seemed to be selling the “experience” of shopping in their stores/centers, complete with specialty food offerings, intricate seating, and, in the case of Washington Prime Group, a live mural demonstration urging attendees to “make their mark.” Retailers who deliver more than just product seem to be weathering the retail storm far better than others… and the exhibitors taking the same approach managed to turn several heads during the show. Food is still king. With several franchises opting to build out mini-stores to showcase their product, South Hall was the place to be around lunchtime. Several new, immersive food and beverage concepts stopped by our booth, eager to bring “more than just a dining experience” to new markets. Nearly all traditional retail centers have full service and quick casual restaurants high on their target list, but the buildout costs for some of the higher-end concepts remain challenging. Restaurants need to be an investment into the future foot traffic at the center. The tenants looking to expand their portfolios are serious about doing so. While value-oriented retail darlings like TJ Maxx and Marshall’s continue to seek new locations, the team spoke with several new concepts looking to enter markets for the first time. These newcomers generally target smaller stores and strong demographics. Many of the brokers and tenants reps we spoke with expressed genuine interest in doing deals and strategically growing their footprints, rather than just “testing the waters” to see what kind of concessions they might be able to negotiate. Pop-ups are here to stay. Some went as far as saying that the retail model needs to shift to more of a hotel model, with ultra-short leases driving cash flow. We don’t necessarily think things will be so dramatic, but we are eager to test first-to-market concepts by designating spaces in our developments to incubate local and national operators on a shorter-term basis. We can expect to befriend our e-comm rivals in the not-too-distant future. Amazon at a bricks and mortar conference? You bet. The e-comm giants, as well as their digitally native brethren, are finally understanding the value of using physical retail to introduce new customers to a brand, to eliminate friction points from shipping and returns, and to create a company identity and build loyalty. Expect many of these companies to “test the waters” with pop-ups before committing to a long-term lease. Big data is helping landlords better understand their customers. Retailers have long had the upper hand in shopper data collection, but the tide is turning. New technology is allowing landlords to better understand their shoppers. GPS services on phones release a treasure trove of demographic data, and savvy vendors have converted those billions of pings into shopper profiles once only available via loyalty program profiles or retailer’s online databases. Expect this to impact merchandising strategy going forward. Big boxes can be seen as a hindrance… or an opportunity. Store closings remained a hot topic of discussion this year. After the wave of bankruptcies in 2017, investors have a real sense of the cost of re-tenanting, and in many cases, reinventing, large box space. Many of these boxes are in prime locations and offer unparalleled visibility and parking relative to smaller inline spaces. Several architecture firms are already well-versed in these creative redevelopments. Owners need to be prepared to invest and apply more creative approaches to space than simply subdividing and mothballing unusable areas. Retail is evolving, but it’s definitely not dying. The dire headlines from 2017 still have some investors shell-shocked, but it’s clear that retail is at an inflection point. With a record number of new concepts in the space and continued turnover of underperforming stores, now seems to be one of the best times to explore investment into the space. Correctly merchandising centers and finding ways to engage the local community will be key to developing flourishing spaces for the next generation. Bridget Beckeman is the Director of Retail Strategies at The Wilder Companies. She will be sharing insights on the industry via Wilder’s LinkedIn page and will be speaking on a panel on the Future of Retail at ICSC’s New England Conference and Dealmaking session in July. If you’re interested in learning more about what we do and whether there might be opportunities to work together to optimize your retail portfolio, send us an email at bizdev@wilderco.com.